Dr. Andrich is favored and respected among his optometric and medical colleagues, athletes and patients for his outstanding achievements and successes in sports vision training and concussion rehabilitation. He is a graduate of The Ohio State University College of Optometry in Columbus, Ohio. Dr. Andrich is the founder of The Vision Development Team where he practices with his wife Patti Andrich, OTR/L in North Royalton, Ohio, a suburb of Cleveland. Dr. Andrich is actively involved in leadership opportunities through local, state and international organizations. 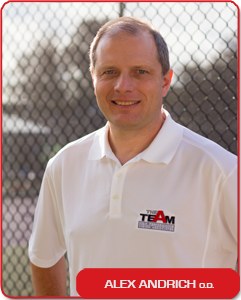 He is the co-founder of The International Sports Vision Association. He is also a clinical associate of The Optometric Extension Program, Neuro-Optometric Rehabilitation Association, and a certified Fellow of the College of Optometrists in Vision Development, where he serves on the International Examination and Certification Board. Additionally, he provides vision rehabilitation services at University Hospitals Parma Medical Center. Presently, he serves as the team Vison Coach for the Cleveland Gladiators of the Arena Football League and serves as a vision consultant for the Lake Erie Monsters of the American Hockey League. Dr. Andrich offers exclusive national and international lectures on the topics of advanced sports vision training techniques, vision rehabilitation, and sports concussions. He has been a guest speaker for the national television program, “American Medical Review” and has been featured by the Cleveland Plain Dealer highlighting sports vision training. Additionally, he has the distinction of being featured on the Paul Harvey Radio Program. Dr. Andrich is committed to developing advanced, strategic approaches to training visual performance skills allowing amateur and elite athletes to take their game to the next level.